Stephen F. Austin State University Professor Dr. Linda Black received the World History Association's Pioneers in World History Award, which annually recognizes distinguished scholars or educators. 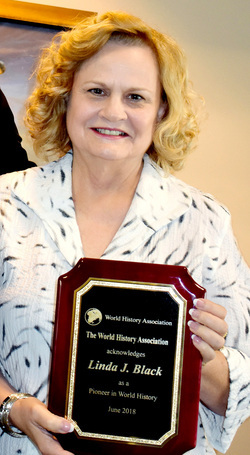 NACOGDOCHES, Texas - Stephen F. Austin State University Professor Dr. Linda Black received the World History Association's Pioneers in World History Award, which annually recognizes distinguished scholars or educators. "This is such a special honor because I began my career as a high school world history teacher and have been involved in this field for more than four decades," said Black, who is a faculty member in the James I. Perkins College of Education's Department of Secondary Education and Educational Leadership. The World History Association is a professional association of scholars, teachers and students organized to promote world history by encouraging teaching, research, publications and personal interactions. "I am so fortunate to have had the opportunity to work with outstanding university scholars and other educators who have helped develop a truly global vision for this field where students, no matter where they live, can see themselves and their cultures represented in history," Black said. Reflecting on her career, Black has experienced many milestones and academic achievements. She began as a high school teacher in San Antonio and later moved to Houston where she taught honors, gifted and talented, advanced placement, and English as a Second Language students. "One of my favorite parts of teaching world history is the students' excitement when they discover the human side of history, particularly the stories and the voices of the people involved," Black said. "History is such a vital subject for helping understand the world around us, as well as for enabling students to develop lifelong, critical-thinking skills." Black has served in many capacities statewide, including the College Board Test Development committee that created the advanced placement world history course and the first two exams; and the World History Association Executive Council. Nationally, Black has been a member of the National Council for the Social Studies, National Center for History in the Schools and the Society for History Education. As an educator, she continues to conduct research, publishing and editing articles, and serving on editorial boards. Her work has been published in myriad journals and textbooks.